Find Leshiba Wilderness perched atop a plateau high up in the Soutpansberg Mountains, now a proclaimed UNESCO Biosphere Reserve. Be inspired by this hand-sculpted luxury lodge. It’s a holistic retreat, centre for indigenous knowledge and true celebration of Venda culture and artistic tradition. Encounter rhino, giraffe, zebra, sable, brown hyena and antelope on game drives. Relax in the main area and watch game pass by on the plains below. Drink in the vitality of Venda culture. Travel back in time with a visit to ancient San rock art sites. Horse-ride (intermediate and advanced) or choose from numerous self-guided walking trails. Swim in clear mountain rock pools on warm summer days. 5 cosy thatched cottages interconnect via funky courtyards in the Venda Village – a characterful collection of Venda-inspired buildings perched on the mountain’s edge. 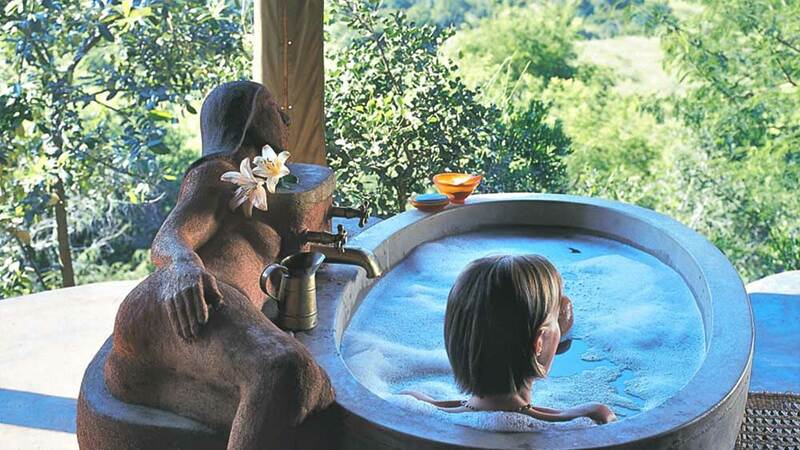 2 very private luxury suites are perfect for romantics with plunge pools and great views of the game-rich plains below. 8 bed self-catering Hamasha Bushcamp is surrounded by trees and nestled within a spectacular amphitheatre of high cliffs and mountains. Peaceful, private – Ideal for family reunions. Sleeps up to 28 people in simple but comfortable rondavels with shared facilities. Perfect for yoga, photographers, birders or botanist groups. Also available as a unique conferencing centre. 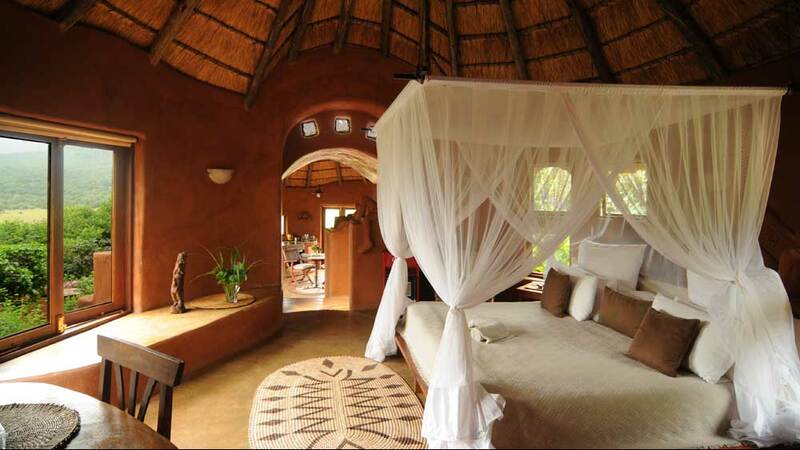 Lie back on circular built-in seats with big comfortable cushions in the thatched dining room overlooking the valley. In front is a deck with a pool and fire pit linking the lounge and kitchen. Spot game on the plain below or plot the stars while chatting around the fire. Leshiba Wilderness is one of the four “Pearls of Limpopo” – The circuit is: Leshiba Wilderness, Kololo Game Reserve and Mopane and Madi A Thavha. An additional 10% reduction in cost is available for those booking all four properties in a circuit. Relax in Leshiba’s one-of-a-kind outdoor bathroom with oval stone bath and sculpted outdoor shower. 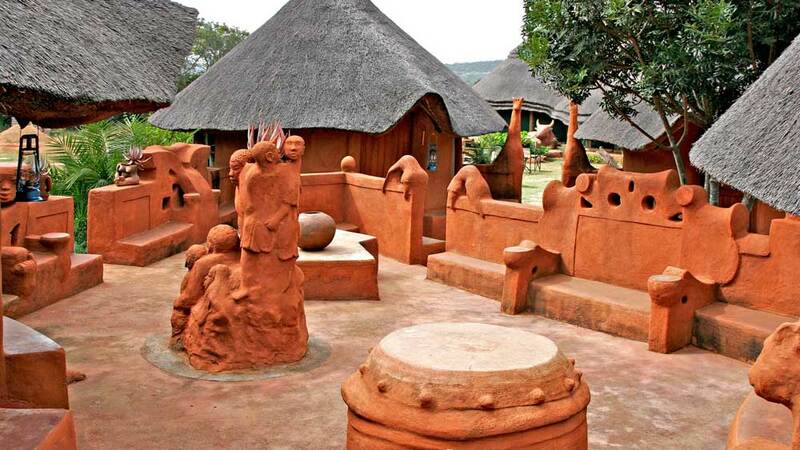 Take in the funky Venda Village, conceptualised and hand-crafted by renowned Venda artist, Maria Mbasa. Walk in the medatative Leshiba Labyrinth. Feel the sense of freedom as you set off on the walking trails. Lose yourself in a ‘lost Eden’ and truely connect. It’s great simply on its own or as part of the Pearls of Limpopo Circuit. Combine Leshiba with Umlani Bushcamp in the Timbavati or Kololo Game Reseeve, Welgevonden. All are Fair Trade accredited. Visit en route to or from the game reserves of Tuli or Northern Kruger. Book out a private suite for a week – or two. Bring books, leave a different person. Couple with beach in Seychelles or Mauritius as a malaria-free wilderness retreat. Leshiba established its Centre for Indigenous Knowledge to research, develop and promote the rich culture and heritage of the people of the area. The Centre is a “think tank” to secure indigenous knowledge and emerging technologies in fields as diverse as music, dance, traditional medicine, medicinal plant harvesting, traditional building, agriculture, wood carving, pottery, textiles story-telling and beadwork. The Rosmarin and Straughan families have put heart and soul into Leshiba Wilderness. The story of Lesheba is intimately linked with John and Gill Rosmarin’s passion and a desire to get out of Gauteng, and Noria’s enthusiasm for sculpture. Few who visit leave untouched by the magic of their time there.